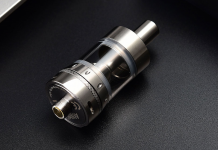 The Ehpro Billow X RTA is the latest RTA from longtime vape manufacturer EHPRO. It’s the latest in the Billow line of RTAs for them, a line they have been making for years most recently the Billow 2.5 and Billow 3 that came out in 2017. It uses a large staggered 2 post deck similar to the Mantra RTA. It’s available in 3 colours Black, Gold and SS. The market is booming for dual coil RTAs and has been for quite a few years, so the EHPRO Billow X enters a crowded market. It didn’t feel very new or different to me personally though. The 1st thing that came to mind when building this, was that it’s extremely similar to the Mantra RTA which was a good RTA released late 2017. I love that they include a resin drip tip as it makes it stand out a little more. All 3colourss have the same resin tip design which is a mixture of black, brown, grey and white. 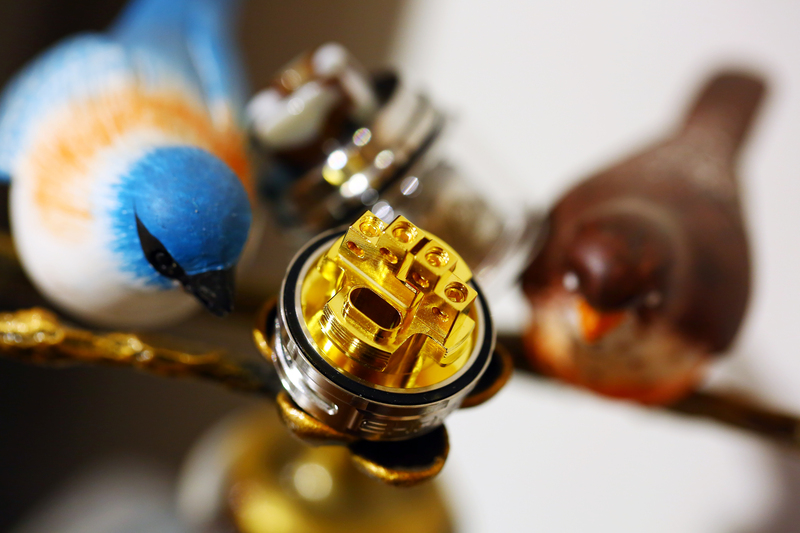 The 4ml capacity is a good size for a dual coil RTA but the 5.5ml bubble glass makes it really good and is included. The AFC is nice and smooth and easy to use and on a stopper. Let’s talk about the build deck now. It uses a dual post, 2 holes per post, staggered deck. Almost the same as the mantra except for a slight difference, the mantra had more open air between the posts and a small block with a hole on the bottom between the coils. The Billow X has the post much closer to each other with only a small crack between them. The deck is easy to build since it is staggered and each lead gets it’s own hole and coils can be installed separately. The holes are large enough to accomodate big fancy wires, but also work well enough for simple round builds. The post screws are good quality hex screws which are my favorite. Wicking is pretty easy overall. You’ll want to thin out your leads and cut them so they sit flush on the bottom of the deck. There are set cutouts for them to drop into. Performance wise, I used it as a Dual Coil RTA only, as intended. My max recommendation is 3mm ID however 2.0-3.5 also worked well. I’d say 3mm is the most ideal. I ran mostly fancy wires such as fused claptons and aliens but also ran one round wire build. All of them worked well but i prefer the fused clapton personally. Overall the flavor was above average for a dual coil RTA. I wouldn’t say one of my top 5 best, but still better than many out there. Very similar to the Mantra, it’s above average, but not impressive, but I did like this a little better than the mantra. Is it different enough to gain attention? 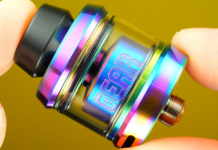 So with all that said, do I recommend this RTA? I don’t like to do a hard yes or no, this one i’m going to lean a little towards the yes. I can’t really find any flaws in it, it works great, it’s easy to build, gives great flavour, I just have to wonder if it does enough different to gain attention. Anyone that buys it should be happy with it. But I don’t know if it’s going to wow anyone either. Still, it’s a great RTA and is hitting the market May 2018 (next month) and there are a lot of billow fans out there, likely ready to jump on this.